A while back Jesse’s spanish teacher (Gabriela) offered to give us both a “cooking class” and show us how to whip up some classic Argentine empanadas here at our house. Finally, a couple weeks ago, we made it happen. She brought over a couple recipes and we all went shopping for ingredients. Even though I go shopping several times a week, it was fun going with her to see how she (and other Argentines) interact in day to day activities. We had a great time talking and sharing the cooking responsibilities. 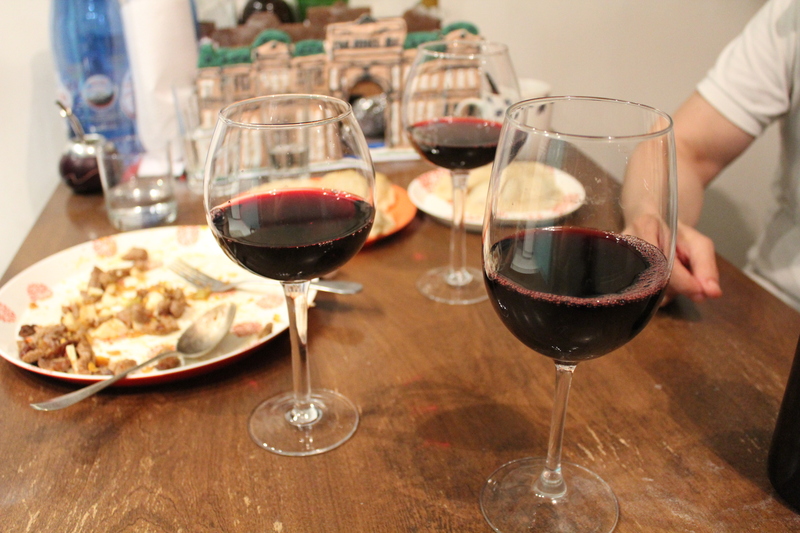 There is an old cooking show that Gabriela told us about that is kind of like the Argentine Julia Childs. Doña Petrona is the cook and Juanita is her assistant. So now, in Argentina, when people are cooking together they usually make a little fun and one person becomes “Juanita”. Making empanadas together, we were all Juanita at one point or another. Empanadas are popular in many different countries throughout Latin America and the Caribbean as well as in Spain. They are like mini-calzones and can be filled with anything from beef to chicken to fish to veggies or even with something sweet for dessert. (Little language note: the primary translation of the verb empanar is to bread something or to coat it with crumbs, so empanada would be breaded.) 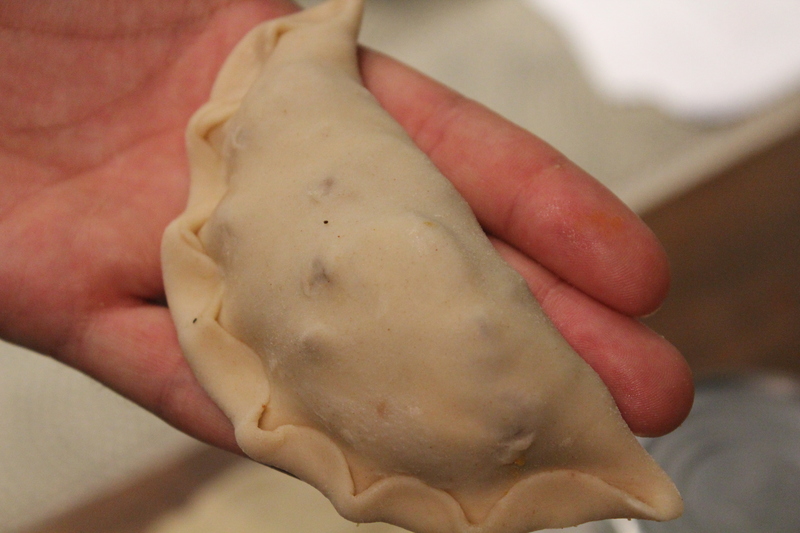 The traditional Argentine empanada is filled with ground beef, onions, hard boiled eggs, olives, and spices. However, like pizza in the States each region in Argentina, and really each country in Latin America, has its own individual take on the empanada with a different filling depending on what’s most accessible and cheapest. In Chile, for example, I read that because of the higher price of beef there, the filling is primarily made with fish. 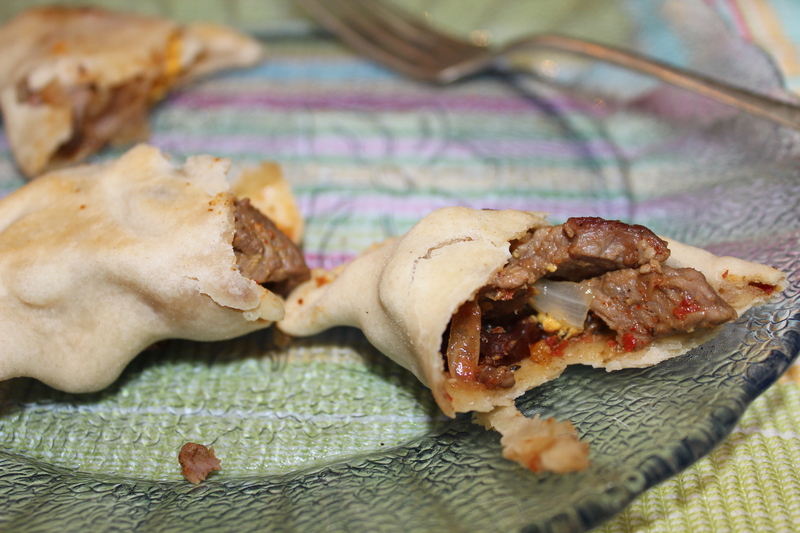 In Argentina, the classic empanada filling is some sort of carne or beef, but also may include potatoes or raisins. Empanadas are eaten as snacks here – as an appetizer or with your afternoon coffee and almost always at a party as little handheld treats. A lot of stores and restaurants sell their own special empanadas caseras or homemade empanadas. More often it is pizza places or panaderias (bakeries) that sell them, but you can also find empanadas at little cafes. We have a couple places that sell really delicious empanadas around us. There is a small restaurant (Almacén El Nono Amigo) that sells wine and fiambres (cured meats and cheeses) that also has empanadas filled with a vinegary roasted eggplant or with a sweet corn filling. They are just amazing and I would eat them every day if I could. Even our local pescaderia (fish monger) has their empanadas filled with potatoes and tuna or salmon that are perfect for a meal or an afternoon snack. 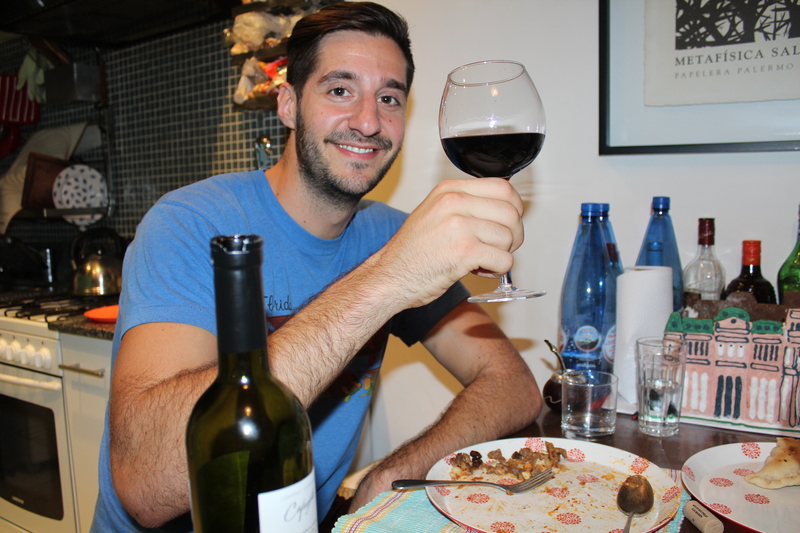 On a list of the most traditional Argentine food – empanadas would definitely be in the top 5 and I am glad for it. 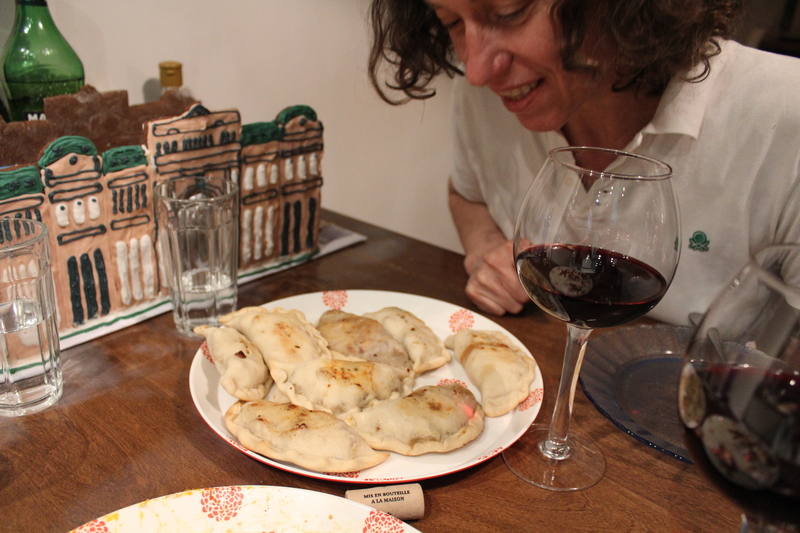 Anyway, last Friday Gabriela brought over a bottle of wine and we made empanadas desde cero (from scratch). And when I say from scratch, I mean from total scratch. 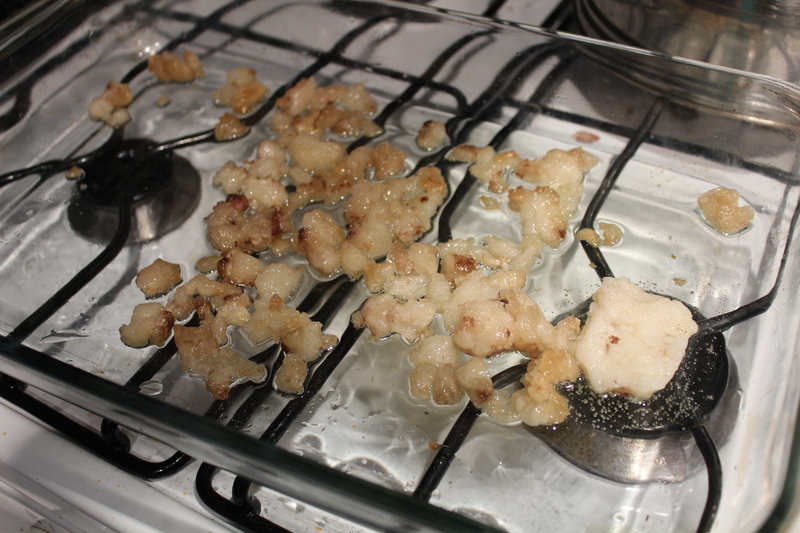 We even rendered the lard needed to make the empanada dough. It’s the first time I’ve ever rendered lard (except when making a southern breakfast and you cook the bacon and keep the fat to cook the eggs in. Delicious!) I know the thought of rendering lard is understandably a bit scary and icky to most people, but if you think about it, a lot of traditional food is made with lard (cuban bread… some southern biscuits…) and isn’t it the best thing to know where your ingredients are coming from and to have the purest ingredients possible? Yes it is. I think so anyway. 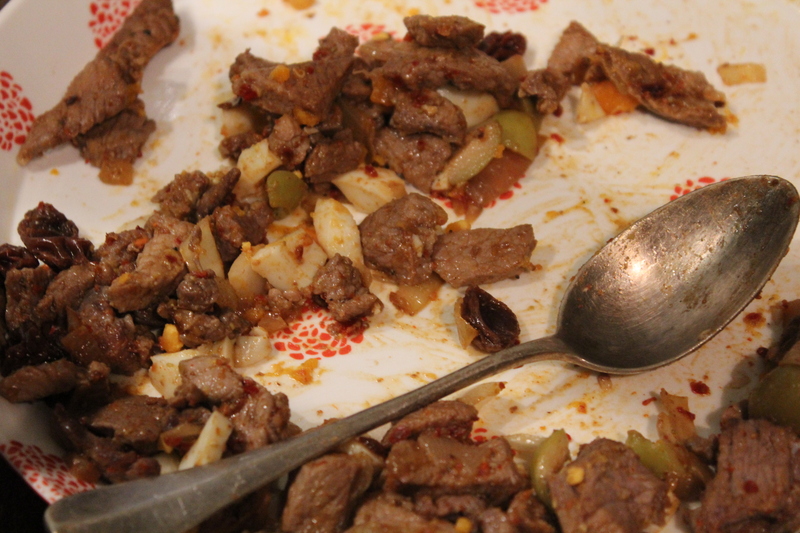 The recipe we made was a carne cuchillo or sliced meat (cuchillo = knife). These are a little different than the traditional ground beef but still quite delicious. We also included raisins in ours. I was a little hesitant about the raisins. I mean, the idea isn’t crazy. Usually having a complex flavor combo balances food out and makes the flavors pop more – sweet and savory and spicy all together is generally really awesome. But for some reason for me raisins have always been strictly a sweet food. And I clearly had never had empanadas with raisins before. But I am never one to be stuck in my ways, when it comes to food anyway, and needless to say I was pleasantly surprised how much I liked it. The raisins provided the perfect balance for the savory flavors of the other ingredients. 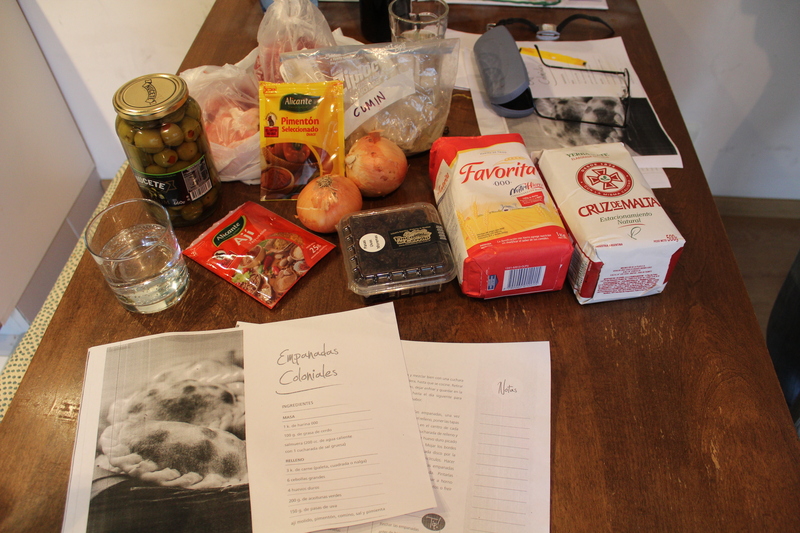 Everything you need to make empanadas, including some maté! 3 kg beef – we used bola de lomo or beef round – a cut of beef that is, according to our butcher, the best cut of beef for empanadas. 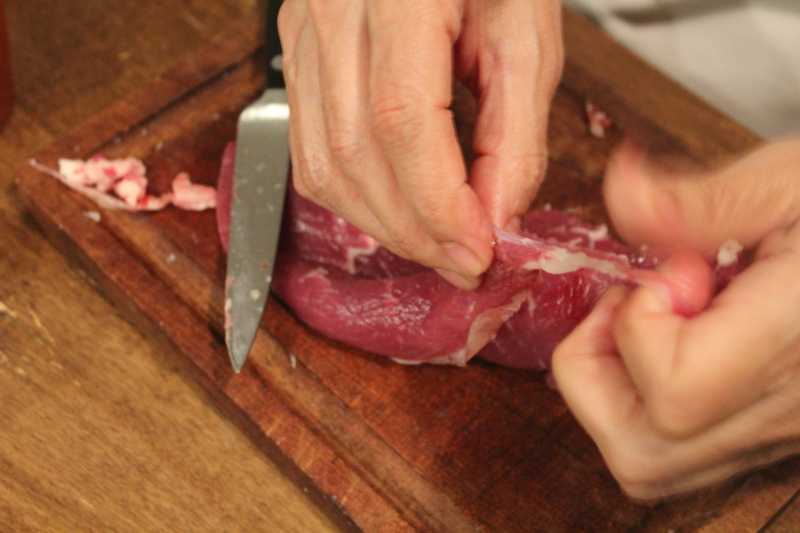 The meat we got from the butcher was sliced thinly in about 1/4-1/3″ slices, which we then cut into smaller pieces. See below. 150g raisins, rehydrated by covering the raisins in warm water and letting sit for about 30 minutes. *NOTE 1: Ají molido or triturado is a very common spice in Argentina. It is used in chimichurri, the condiment served with asado and many other argentine dishes. From what I’ve read it is a ground red pepper, but it’s not really spicy. This is an interesting article I found on it that gives the best explanation I’ve seen. In Argentina, you can buy this spice almost anywhere food is sold. You can see the packaging for the ají we bought in the picture above. When we were at the carniceria buying the meat, the butcher was cutting off thick pieces of fat and was throwing them out. Apparently there are people who come around to collect the fat and make it into lard. I won’t tell you what we’ve heard about their level of sanitation while making the lard. Suffice it to say that I don’t think I’ll ever be buying lard pre-made here. Before he threw all the fat out, Gabriela asked the butcher if he could save it for us. We got enough of the good stuff to make lard both for our empanadas and for Gabriela to make bread the next day. 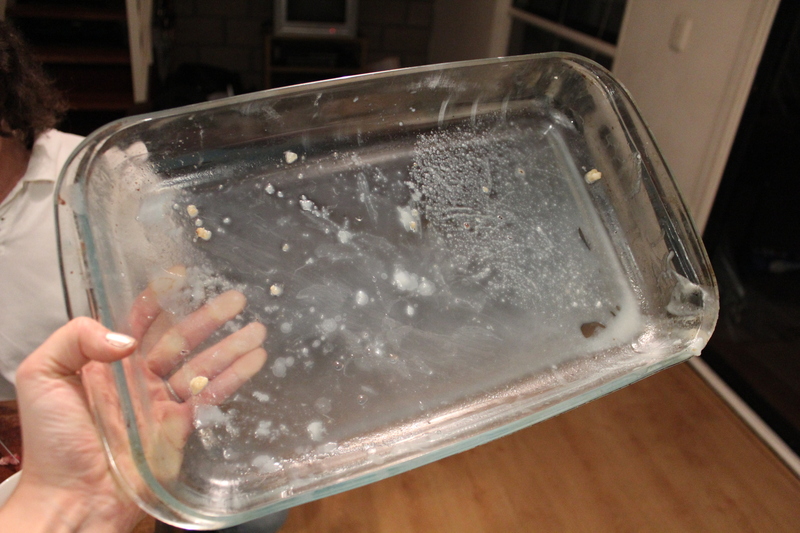 When we got home, the first step for the empanadas was to cut the larger pieces of fat into smaller ones and render the lard by putting the fat in a pyrex (or ceramic) dish into a hot oven (about 375). You can see in the upper right corner of the picture above the pot with boiling water (well it’s not boiling yet… but it will get there). While the lard is being rendered, you can make the hard boiled eggs and rehydrate the raisins. 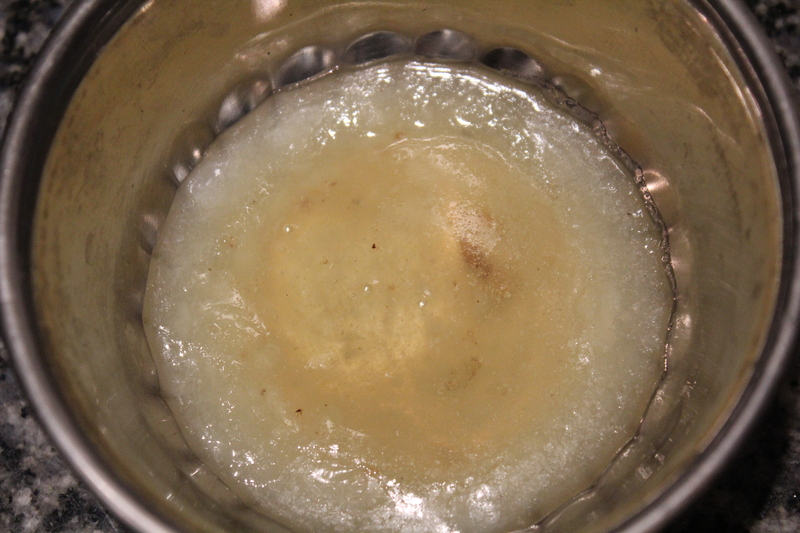 The fat will shrink and will render a clear liquid. When all the liquid is rendered (about 20-30 minutes) pour the clear liquid into a small bowl and let cool. It will cool quickly and doesn’t have to be 100% room temperature, just roughly. Like everything else in this recipe. When the lard is poured into the bowl and the pieces of fat are removed, you will still have some of the lard coating the bottom of the pan. This is a great thing and a good reason to use the same pan to render the fat and to bake the empanadas. Keep the pan this way. You can use it when you cook the empanadas to give it more flavor and brown it a little. 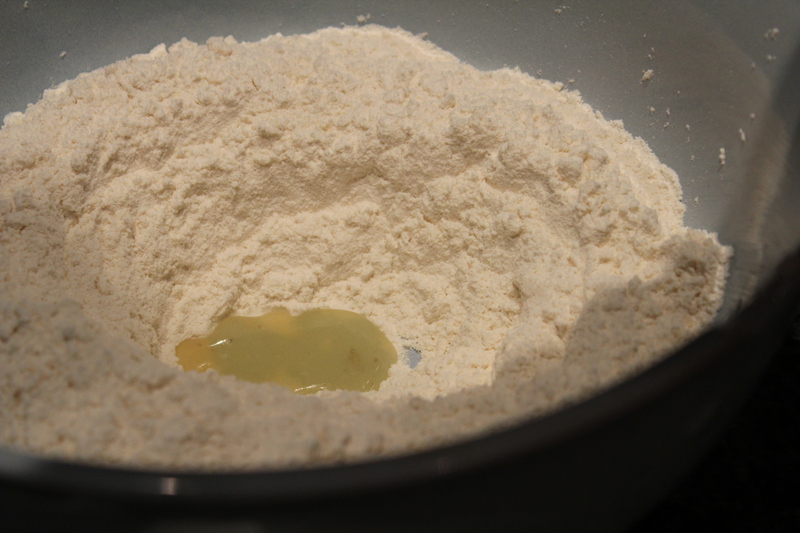 Pour your flour in a large bowl and make a well in the center. Pour some (about 1/3) of the cooled lard in the center of the well and begin to incorporate it by swirling your hand (or a wooden spoon) around the flour slowly incorporating the lard. At the same time, slowly add the warm water. Jesse slowly bringing the masa (dough) together. Add the rest of the lard, with a little water, in 2 additions using the same method. Add more water very slowly just until the dough starts to come together. It’s a fine balance between too dry and too wet so go slowly. 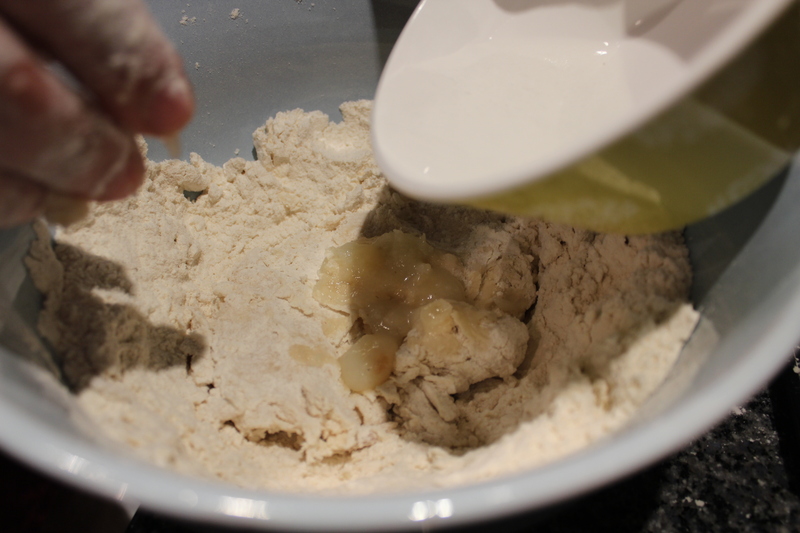 Once the dough starts to come together, remove it from the bowl and gently knead it a couple times on a floured or nonstick surface to make sure it’s uniform. 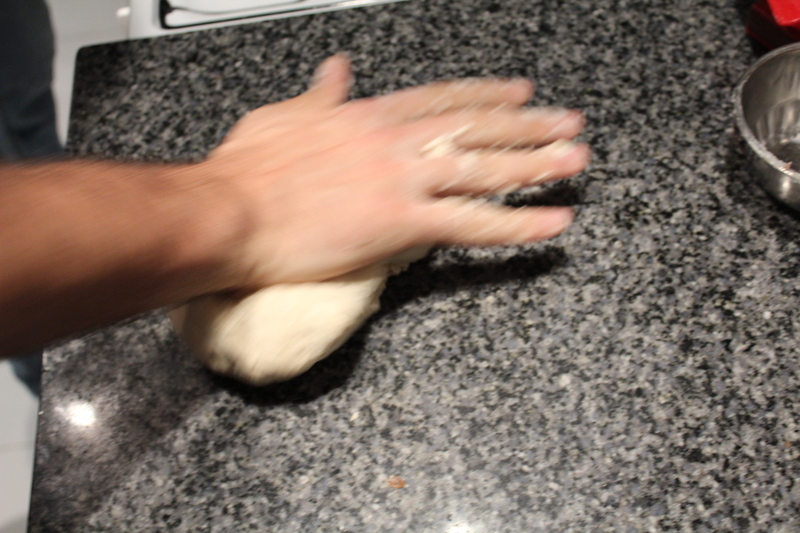 Kneading also develops more structure in the gluten and increases the elasticity so you can roll it out later and it will stretch and not break. You don’t want to work it too much or every time you try to roll it out it will spring back to its original shape and also the cooked dough will be a little dryer and less delicate. Clean and oil the bowl with a thin layer of vegetable oil. 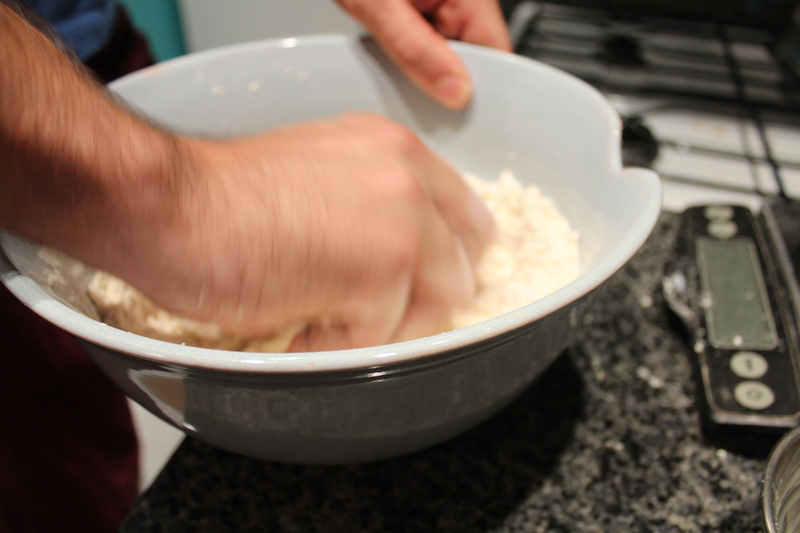 Once the dough is properly kneaded, form a ball and place it back in the bowl. Cover with a cloth and place it in a warm dark place – above the refrigerator – until it rises (about 30 minutes). Because there is no leavening agent it won’t double in size, but it will get a little bigger. While the dough is rising, you can prepare the filling. First, cut the tendons and any connective tissues out of the meat. If you leave it in, it will be too difficult to chew and will make the empanadas icky. (That’s a technical term…) Anyhoo, cut those buggers out and then cut the meat into small pieces. 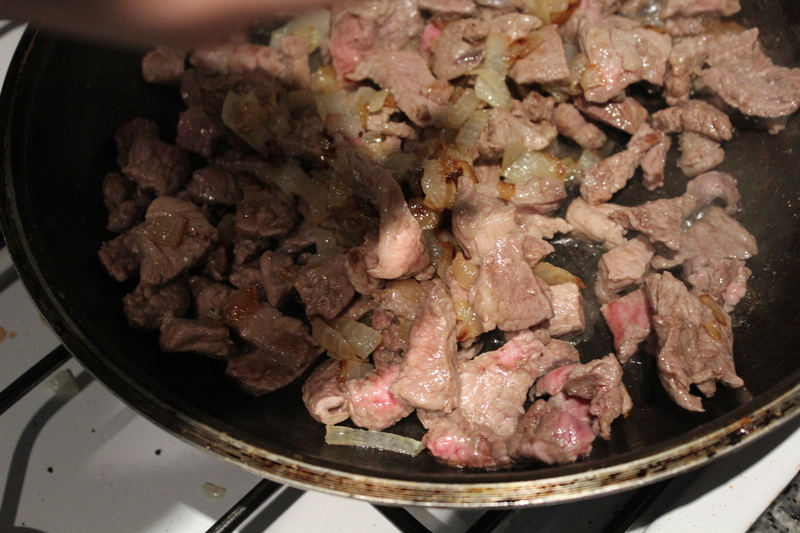 Add the meat to the pan to brown it. Remove the meat and add the onions, along with a little extra lard, to the pan and cook until they soften and become a little more transparent. Add the meat and then the spices and toss together. NOTE: The spices are actually optional. We did a little bit without the spices. They were actually really good – you get more of the pure unadulterated flavors of the meat, onions, olives, eggs, and raisins. But the spices are really tasty too! When the dough is risen, divide it in two and form two discs. Roll this out to about 1/4″ thick (or a little more) and cut rounds. The finished rounds should be about 5-6″ in diameter and about 1/8″ thick or a little smaller. You don’t want them too thin or they won’t support the filling, but too thick will make it too bready. 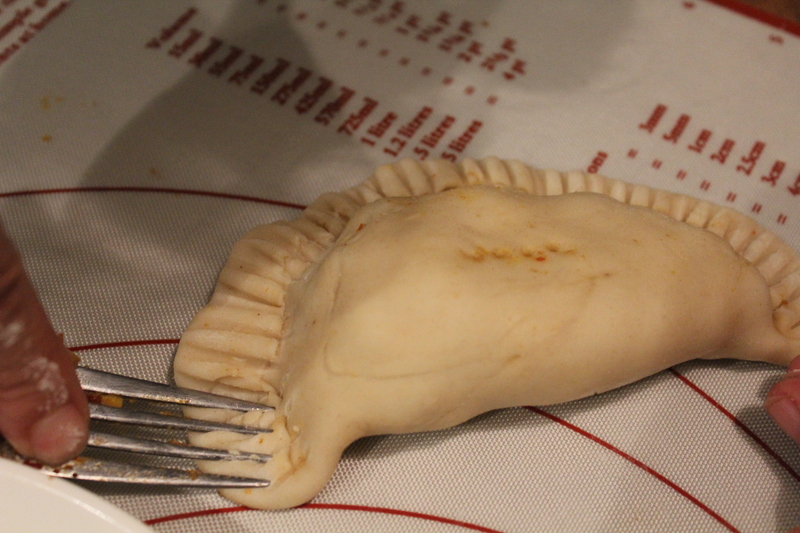 If you can see some of the filling through the uncooked empanada, the rounds are too thin. 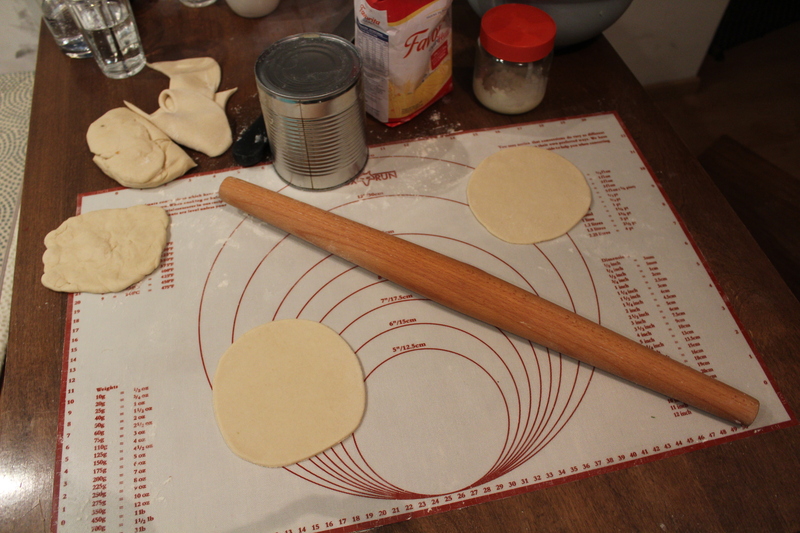 We have no metal rounds big enough to cut empanada rounds at the right size, so we improvised. I used a large can to cut rounds, keeping the dough at this point a little thicker than 1/4″ thick and then rolled the rounds out more once they were cut trying to maintain the round shape. 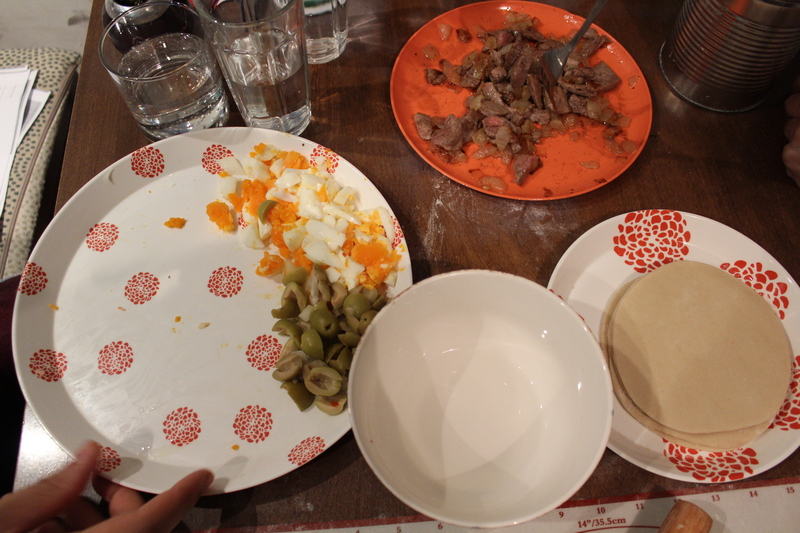 So here we have our eggs and olives, roughly chopped, our meat/onion/spice mixture, and our raisins, which are in the meat mixture. Gently mix it all together. Ready to fill the empanadas. 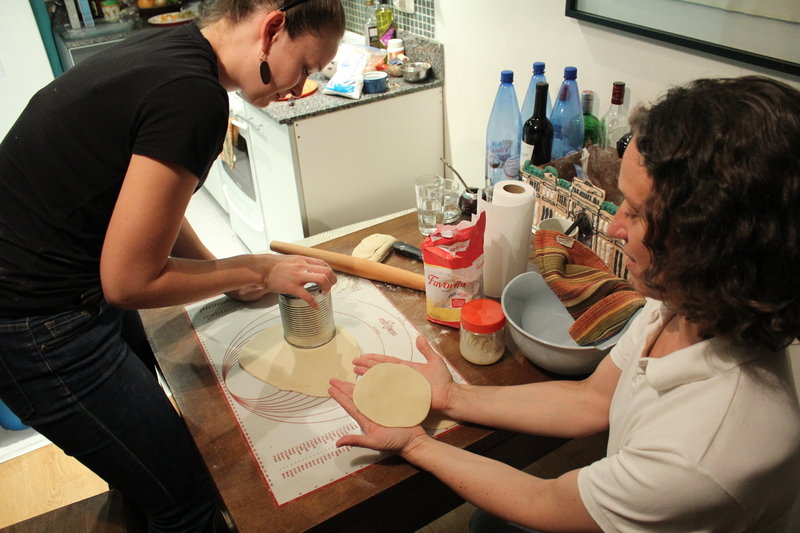 Gabriela and Jesse started to fill and seal empanadas while I was still rolling the dough out. To make the assembly process easier, make sure you have everything easily accessible: empanada rounds, filling, a small bowl of warm water, your pan for baking, and (if using) egg wash with pastry brush. Place a couple spoonfuls of the filling (rellena) on one side of the round, leaving about 3/4″ around the edge. Dip your finger in a little water and lightly wet the edge of the round. Fold the dough over the filling and line up with the other side. Press the edges down well and then seal the empanada. Now this can be done in any number of ways. Most restaurants make their empanadas with different designs for the seal or shape to signify what the filling is. 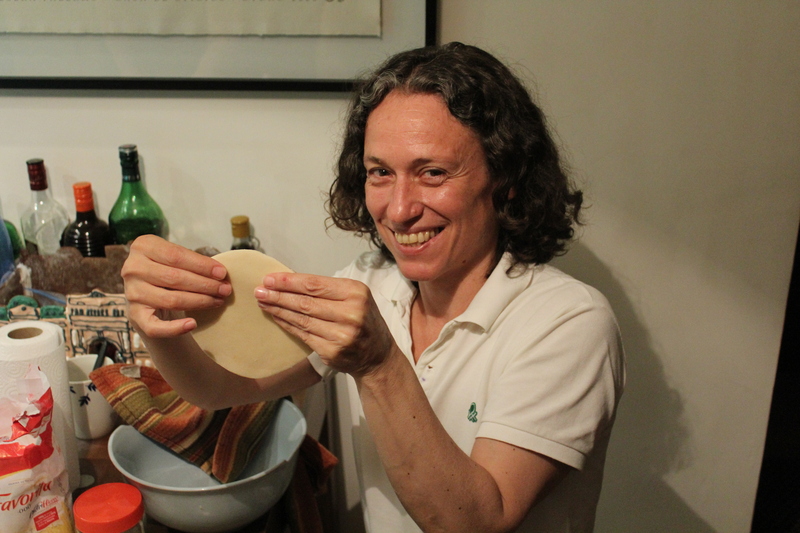 A video showing Gabriela sealing the empanada. A finished empanada. All you have left is to poke a couple small holes (we used a fork) in the top of the empanada to allow the steam to escape. So once you finish making the empanadas, you can give them a quick egg wash (beat an egg with a little water or milk, then using a pastry brush, brush a little on top of the empanada). We didn’t actually do this so we didn’t get the same shiny brown finish, but they were still tasty. Put the sealed empanadas on the pyrex dish that is covered in the lard and bake in a hot oven (about 375) and bake until the tops are golden brown. Since we didn’t do an eggwash, we turned the empanadas over about 3/4 of the way through to get some browning on the other side. Perfect way to wait for the empanadas to cook. Yummy empanadas fresh out of the oven and still a bit too warm to eat. Torture. From start to finish the empanadas take about 4-5 hours. It’s definitely a process, but it is also a task that is rarely undertaken alone. People, mainly women if we’re being honest, come together before a party or dinner to make their family’s empanadas with many types of filling. Grandmothers, daughters, and granddaughters gather around the table to roll out the dough, fill the rounds, and seal the empanada and, like our little empanada night, it’s a very social event that allows families and friends to connect with each other and get some tasty treats in return. I hope you’ll give it a go and have fun with some family or friends! Wow- they look delicious. And, knowing how much you both enjoy being in the kitchen- it must have been so much fun!